. Year End Sales and Markets begin ichi 年の市 .
. World AIDS Day . advocated by disaster and catastrophy adviser 山村武彦 Yamamura Takehiko. Not only on the Day of the Great Kanto Earthquake (September 01), but four times a year, including the first day of March and June. On this day in 1999 the first melody for telephones was introduced in the world by 株式会社フェイス (Faith fo Face). created by データセンター運営会社, softbank ソフトバンクIDC. goroawase. The initials of DataCenter look like "DeCember". created in 2006 by デジタル放送推進協会. created in 1896. In Kobe, the first movie was played in a public place. At that time a キネトスコープ Kinetoscope invented by Edison was used. created in 1980 by 資源エネルギー庁 Agency for Natural Resources and Energy. Every month on the 1st is 省エネの日 Day of Energy Saving. created in 2001 by 厚生労働省 Ministry of Health, Labour and Welfare. To protect the life of workers. created in 1958. In 1857 in Kamaishi (Iwate) the history of modern iron processing started at 釜石高炉, now 新日鉄釜石製鉄所. In 1901 the American King C. Gillette ( ジレット) introduced the first safety razor with exchangeable blade 替え刃式の安全カミソリ. In 1942 on this day, the first small nuclear reactor (Chicago Pile-1 (CP-1) was introduced in America at Chicago University under the supervision of Enrico Fermi.
. World Handicap Day, Black Day for the Blind .
. Day of Saint Xavier 聖ザビエルの日 . created in 1872. On this day, the new Gregorian calendar was introduced. The day 1872(明治5)年12月3日 became 1873(明治6)年1月1日. created in 1979. The first service of this kind was introduced to all 23 wards in Tokyo. also on November 3. goroawase with 3 mi. created in 1995 by 凸版印刷. created in 1982. First performance of ET in Japan.
. Santa Claus Day サンタクロース. created in 1992 by the manga painter Hatada Kunio 畑田国男 (1944 - 1996). according to a legend about Saint Nicolaus and the three sisters. 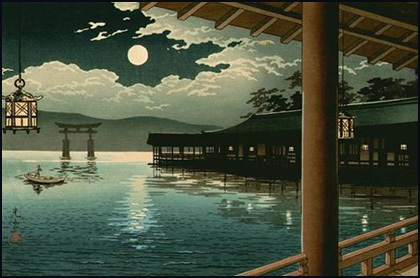 created in 1994 by 日本オーディオ協会. in 1877, Edison invented the gramophone. Kachidoki to heiwa かちどきと平和 "Triumph and Peace"
. taisetsu 大雪 "Big snow" .
. Day of the Christmas Tree クリスマスツリーの日 . 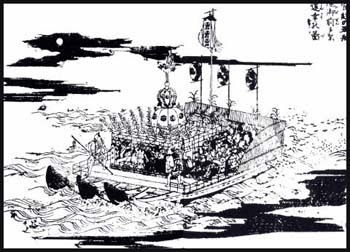 in 1867 the port was opened to foreighn ships (lunar calendar (慶応3)年12月7日). Now it would be the first of January.
. Rohatsu Zen Meeting 臘八会 .
. Needle ceremony 針供養 hari kuyoo .
. Day of the Immaculate Conception 聖胎節 .
. Last Ceremony for Yakushi Nyorai 納薬師. every month on the 8th. Since 1997, created by Sunstar company サンスター. Old things should be exchanged for new ones for the New Year.
. Memorial Day for Natsume Soseki 夏目漱石 . created in 1994 by the Morinaga company 森永乳業. They sold this for the first time.
. hyakuendama no hi百円玉の日 day of the 100 yen coin .
. Jamhuri Day, Republic Day - Kenya . In 1985, カーバッテリーの日 the day of the car battery had been created and then replaced. created by 桂由美 and 内田和子 for the brides. 12 roses to show your love.
. Geminid Meteor Shower . created in 2000. In 1910 professor 鈴木梅太郎 Suzuki Umetaro has started to promote vitamins to prevent beriberi (vitamin B deficit). He called his pills Orizanin オリザニン. 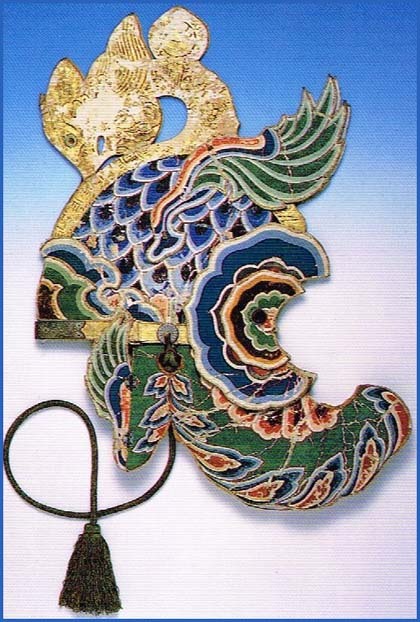 created by 正宗卓 in 2003. Many ladies visit a beauty parlor in December. If 1 and 3 are written close together, it looks like the letter B for Beauty. created in 1874. 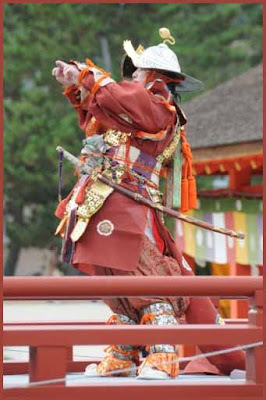 It was decided that the child first born before one, two or more siblings was to be the first-born.
. Festival of the 47 Ronin 忠臣蔵　Chushingura . 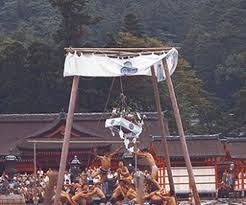 In 1911 on this day four people with Roald Amundsen (1872 - 1928) reached the South Pole.
. Munakata Shrine Festival 宗像祭 . created in 1925. The 東京遊覧自動車会 started on this day.
. Memorial Day for Priest Roben 良弁僧正. in Tokyo and Yokohama, in 1890. 155 telephones in Tokyo, 42 in Yokohama. 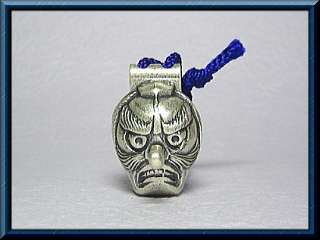 created in 1987 by a paper company in Hachioji, Tokyo 抄紙会社. nenbutsu no kuchidome 念仏の口止め "no more nenbutsu prayers"
Since the deity of the New Year (Toshigamisama 年神様) does not like this prayer, it is now forbidden to utter it until January 16. In 1903 they made the first flight in America.
. Eating Rice Gruel Ceremony 十八粥 . 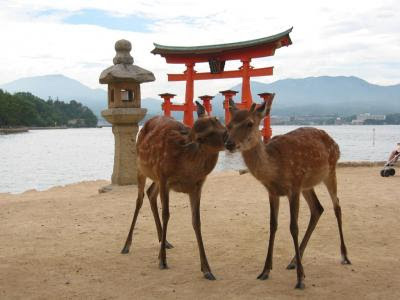 Established in 1945, the UN-section of Japan started work on this day in 1956.
created in 1910. The first pilot was 徳川好敏工兵大尉, starting his flight in Yoyogi Park, flying for 4 minutes, hight of 70 meters and covering 3000 meters during his flight.
. buri no hi 鰤の日 day of the yellowtail . created in 1904. Mitsukoshi Store at Nihonbashi Tokyo opened 三越呉服店. An evil day, to avoid angering the Kami of the Mountains, people should not enter a mountain.
. Inozasa-O 猪笹王 Wild Boar became an Oni Demon . created in 1879．The first lighthouse in Aomori, Tsugaru straight at 尻屋崎灯台, used it.
. Last Ceremony for Kobo Daishi Kukai 納めの大師 . Two lovers could meet before Christmas to reconfirm their love. in 1913 the first had been printed in the New York World. 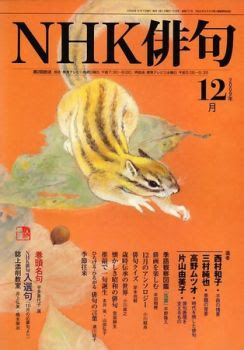 in 1924 the first book with crossword puzzles has been published.
. tooji 冬至 winter solstice .
. Emperor's Birthday 天皇誕生日 . Emperor Akihito was born on this day in 1933.
created in 1982, when people still used public telephones and the handy/smartphones had not been invented . . .
. kurisumasu ibu クリスマスイブ Christmas eve .
. kurisumasu クリスマス Christmas .
. Memorial Day for Yosa Buson 与謝蕪村 .
. Day of Saint John 聖ヨハネの日 . created in 1885 with 139 shops. Rebuilt after the 1923 earthquake. in 1904 the first performance of Peter Pan took place in London.
. Last Ceremony for Fudo Myo-O 納不動 . in 1895. First performance in Paris. in 1927. The first underground from Ueno to Asakusa opened.
. Last Day of the Year (oomisoka 大晦日) .
. Shrine visit at the last night 除夜詣 . buckwheat noodles to cross over into the New Year .
. Ooji no kitsunebi 王子の狐火 "fox fire" at Oji Inari Shrine .
. December, Month of Kagura Dance 神楽月 .
. WKD : December - a Haiku Month .
. WKD : World Days in December .
. Ceremonies, festivals, rituals - December .
. Memorial Days of Famous People - December .
. WKD Kigo Calendar - the 12 Months . 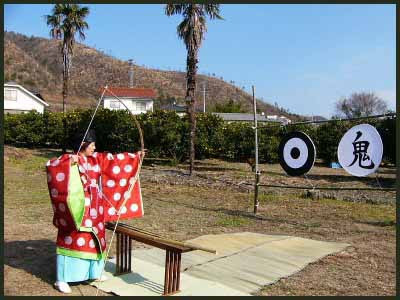 hari osame 針納（はりおさめ） "end of the needlework"
hari yasumi 針休み（はりやすみ） "resting the needles"
in Kyoto and Kansai on December 8. This is the day when Buddhist masses are sung for needles broken during the past year since it is thought that the needles' lives were sacrificed in service. A small three-step altar is set up and hung with a sacred rope and strips of cut white paper which indicate a sanctified area. 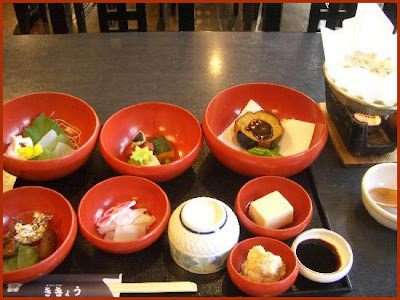 On the top step are offerings of fruit and sweet cakes. On the middle step is a cake of tofu and on the bottom step are various sewing accessories. On this day, the seamstresses take a holiday and bring their old needles to the temple to stick them in a piece of tofu or konnyaku. Threads of the five Buddhist colors were used with the needles.
. shitateya 仕立屋　/ 仕立て屋 tailor, seamstress in Edo . 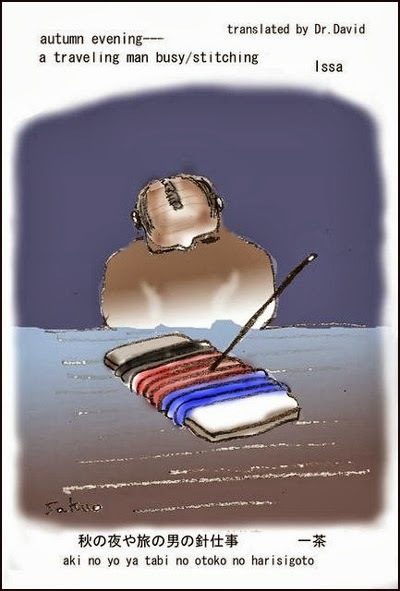 In times of old, fishermen used this day to appease the Sea Gods by sinking broken fishhooks onto the ocean bed. The tradition is now a refined ceremony practiced by housewives, clothmakers and even fashion students, who take a day off work to show their gratitude. They do this by placing their old needles and pins into a Japanese sambo navel orange, while their broken counterparts are stuck into some tofu or konnyaku jelly - a somewhat bizarre, though well-respected, memorial service for little bits of metal. hatsuhari, hatsu hari 初針（はつはり）"first needle"
This was done on the second of January. Usually a small bag was sewed.
. First Work - New Year Kigo . 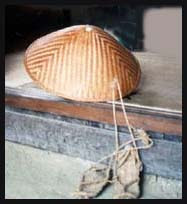 nuibarishi 縫針師　or omonoshi　御物師 . According to the garment they made the price for their work varied. 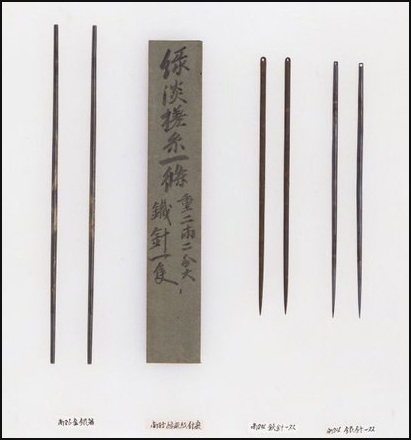 Since the Nara period, needles were made from iron, silver or copper. There are five needles in the 正倉院　Treasure House of the Shoso-In in Nara. 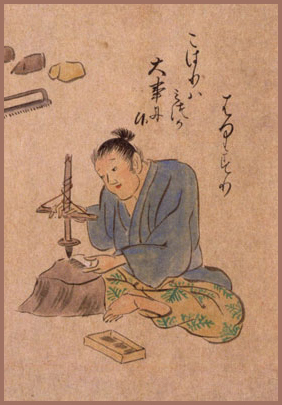 Many low-ranking Samurai made sewing needles as a side job. Thin pieces of metal were cut in the appropriate length and then filed to the best sharpness. The hole was then smoothed with a very small and fine file. After the needle was finished like this, it was once more heated in fire and then cooled quickly to make it strong. The final check included to see it the needle was really straight, otherwise it was hit with a hammer to ajust the shape and then a final polish was applied. Despite all this detailed work needles were rather cheap on the market, for about 50 Yen in our modern currency. Needles were also used to prick a finger and write a love-letter in blood, as told by Ihara Saikaku, Ibara Saikaku 井原西鶴. Written in 延宝3年 , Basho age 32. The word haritate here refers to the tools of an acupuncturist. karakoromo is a pun with a "Chinese robe"唐衣 or a cast-off robe 空衣, meaning a naked body. The accupuncturist uses a small hammer to drive the needle into the skin. So Basho has his shoulder exposed to the doctor.
. tsuki hana no gu ni hari taten kan no iri . her teacher was Iida Dakotsu. 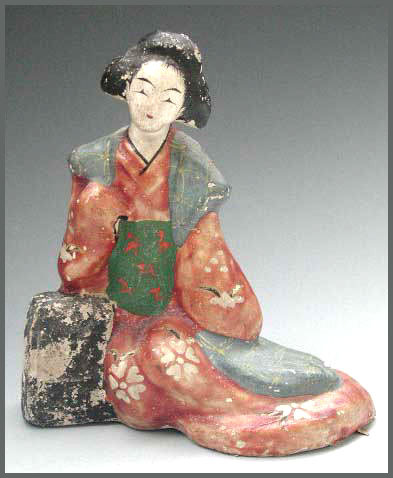 She belonged to the 雲母 Unmo group. haribako 針箱 sewing box "box for needles"
In the tradition of 堤人形 Tsutsumi Ningyo, the eyes are almost triangular.
. Sagara tsuchi ningyoo 相良土人形 clay dolls from Sagara . Once upon a time in a village there lived a beautiful young girl and every night, a handsome young man with carefully combed hair passed in front of her home. And as things go, one day the young girl was pregnant! The young man still did not say who he was and where his family lived. So one night she stuck a sewing needle into his hair and from that day on, he never came back. The people around her begun searching in the neighborhood and found a hole with a snake and a needle stuck in its head. For snakes the iron of a sewing needle is poison and the snake was already very weak. It just managed to tell them to prepare a bath with iris for his pregnant lover, so she would loose the baby of the huge serpent. there is the custom that a pregnant woman should not take part in a funeral. If for some reason she has to participate, she should carry a mirror and place a sewing needle in the hem of her robe, with the tip showing to the earth. ***** . WKD : KIGO CALENDAR . rongi is difficult to translate into English. They were ritual formal ceremonial Buddhist public debates (disputes, disputations, discussions), where the monks had to show their understanding of the Buddhist sutra scriptures. During the two or three days, torches are put up from the entrance to the main hall. 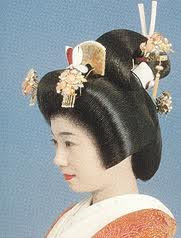 Many priests come from all the affiliated temples in Japan to take part in the rituals. Chishaku-in is the head temple of Shingon Buddhism Chizan Sect. 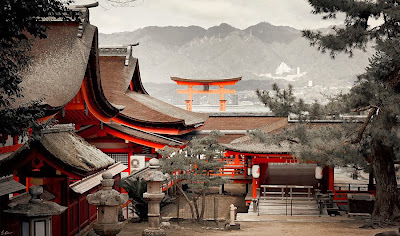 It is the first temple on the Kyoto Jusan Butsu pilgrimage. 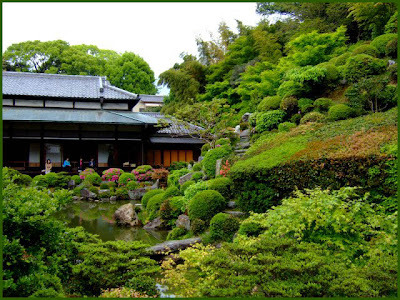 This temple is less popular among tourists but it has excellent Shoheki-ga (fusuma-e) paintings on the sliding paper doors that are National Treasures, as well as a very good garden. Chishaku-in was founded in the 14th century as a sub-temple of Daidenpo-in that was established in Koyasan, Wakayama Prefecture by Priest Kakuban (1095-1144), in the year 1130. 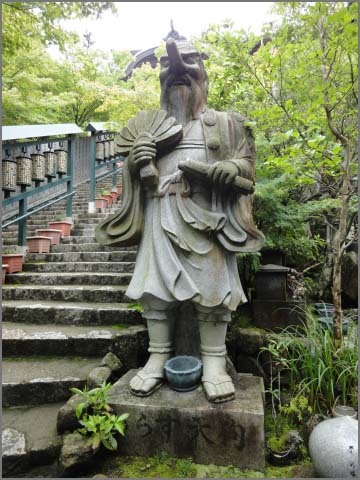 The mother temple then moved to Negorosan in Wakayama prefecture ten years later. In the year 1585, Daidenpo-in, including its sub-temples, was totally destroyed by the actual ruler of the country, Toyotomi Hideyoshi (1537-1598). Chief Priest of Chishaku-in, Genyu (Gen'yu, 1529-1605), who fled from the assault, had to wait until the Toyotomi family was destroyed and the Tokugawa family came to power. 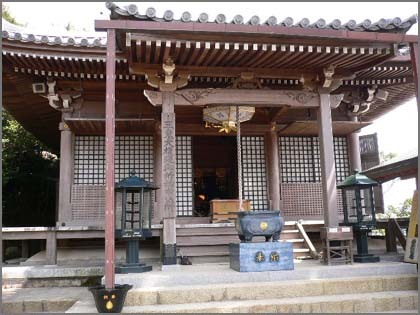 In the year 1601, the first Tokugawa Shogun, Ieyasu (1543-1616) gave a place to Genyu to revive Chishaku-in. Then, in the year 1615, Ieyasu gave them neighboring Shounzen-ji temple that had been founded by Hideyoshi in memory of his son Sutemaru who died in 1591 at the age of three. The extant Shoheki-ga (or Fusuma-e) paintings (national treasures) were those displayed in Kyakuden building of Shounzen-ji. 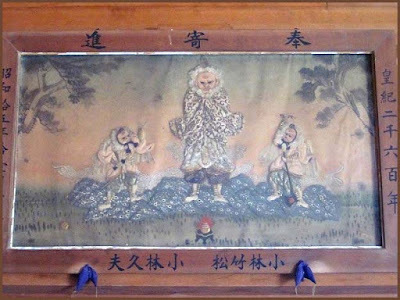 Chishaku-in suffered from several fires during its history and about half of the paintings were lost. Vegetarian meal served at the temple lodgings. We can imagine the monks after the debate, sitting around the long tables and slurping their hot soup in silence. 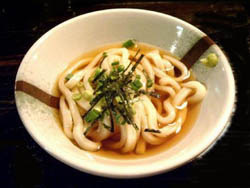 Slurping noodle soup is customary in Japan, and considered good manners.
. Kake udon noodle soup . 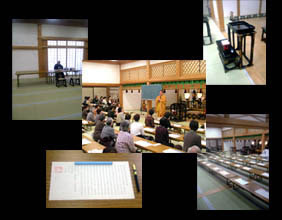 ... the public rongi custom arose during the medieval period, when there were a lot of sects and doctrinal disputes arising within Shingon Buddhism and that the debates were aimed at overcoming misunderstandings of the "true" Shingon Buddhism of the founder, Kukai. ... in the medieval period a number of unorthodox monks were expelled from Mt. Koya, the Shingon headquarters, for doctrinal reasons. Probably there were all sorts of disputes, including material ones as well! I believe several monks were declared heretics, and one whole new sect of Shingon, the so-called Tachikawa Sect of left-handed Tantric Buddhists, was vigorously disputed and opposed, and its texts and mandalas were destroyed. The secular warrior authorities also actively suppressed the "heretical" Tachikawa Sect. Like Tendai, Shingon is an older sect in Japan, so for a while it was a crucible of dissent and dissenting sects, so the 'rongi' at Chishakuin may reflect some of this very vigorous verbal disputation during the period when new sects were challenging orthodoxy and branching off. 'Rongi' also includes debates/doctrinal disputes between sects outside Shingon. 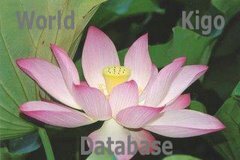 The Lotus (Nichiren) sect and the Pure Land sect were noted for their strenuous debates and verbal disputes, which sometimes turned into fights. 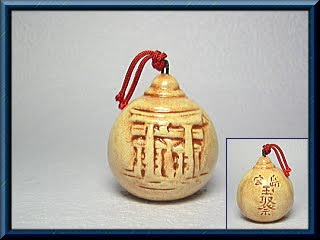 You can see a pale reflection of how vigorous 'rongi' were in the medieval period if you read the No play 'Sotoba Komachi' ('Komachi on the Stupa'), in which Komachi verbally defeats her Shingon monk challengers. During the Edo period fighting (with either weapons or fists) between sects was no longer acceptable, so 'rongi' must have become more subdued, but it would be interesting to know just how disputational the present-day debates at Chishakuin are. The Tibetan Gelugpa, “Way of Virtue”. Originally a reformist movement, this tradition is particularly known for its emphasis on logic and debate. 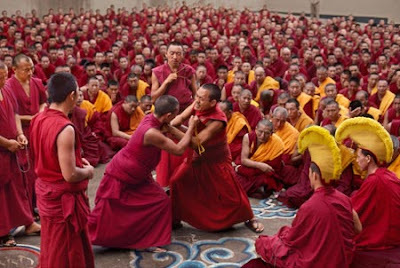 I have seen the Tibetan monks practising debate, almost like a dance, loudly shouting their argument and then CLAP, clap the hands, strech out one hand and point to the adversary. Ho-onko, service for Shinran . 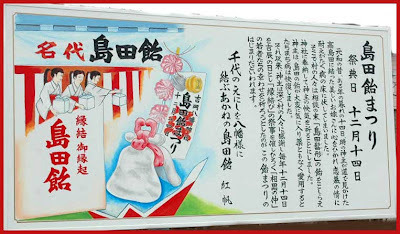 Shimada Candy Festival takes place every December 14th at Yoshioka-Hachiman Shrine in Taiwa-cho, Kurokawa-gun, Miyagi Prefecture. Yoshioka-Hachiman Shrine is said to date back to 1618 when Date Munekiyo, the third son of Date Masamune, and founder of Sendai Clan, moved from Shimokusa to Yoshioka and the shrine was transferred as well and re-built in the current location. The festival is said to have begun on December 14th sometime between 1615 and 1623 when the priest of the shrine fell in love with a bride with a Shimada wedding hairstyle and he became ill. Villagers, worried about the priest, donated candies in the shape of the Shimada hairstyle to the shrine, and that led to the priest recovering from his illness. 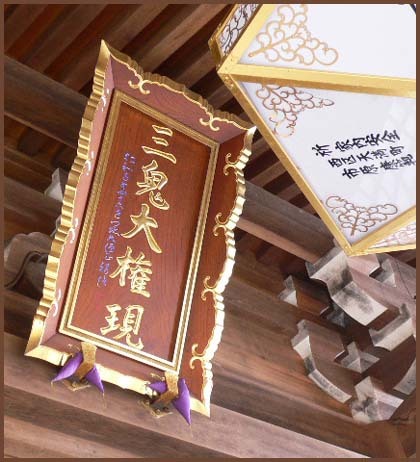 It is believed that the shrine makes love come true and many people, wishing for luck with love, visit the shrine to seek candies. They sell 1000 pieces of this candy. 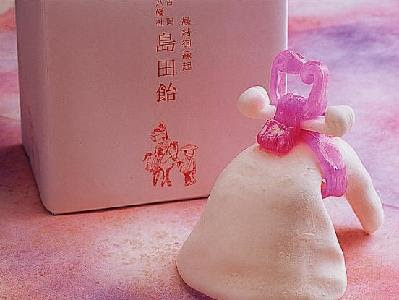 Shimada Candy Festival is a lively festival crowded with stores selling Shimada hairstyle candies and with many young people wishing for good matchmaking.
. Hanayome ningyoo　花嫁人形　bride dolls .
. WKD : Hachiman Shrines and their festivals . ***** . 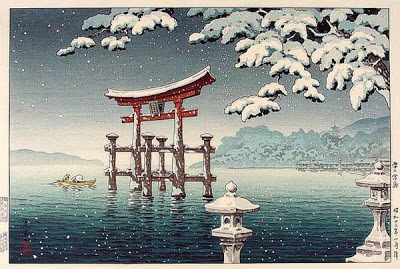 OBSERVANCES – WINTER SAIJIKI .